Harmelen, Frank van, George Kampis, Katy Börner, Peter van den Besselaar, Erik Schultes, Carol Goble, Paul Groth, Barend Mons, Stuart Anderson, Stefan Decker, Conor Hayes, Thierry Buecheler, and Dirk Helbing. 2012. "Theoretical And Technological Building Blocks For An Innovation Accelerator". European Physical Journal: Special Topics 214: 183-214. Boyack, Kevin W., David Newman, Russell Jackson Duhon, Richard Klavans, Michael Patek, Joseph R. Biberstine, Bob Schijvenaars, André Skupin, Nianli Ma, and Katy Börner. 2011. "Clustering More Than Two Million Biomedical Publications: Comparing the Accuracies of Nine Text-Based Similarity Approaches". PLoS ONE 6(3): e18029. doi:10.1371/journal.pone.0018029. Börner, Katy. 2011. "Network Science: Theory, Tools and Practice". In Leadership in Science and Technology: A Reference Handbook, edited by Bainbridge, William S., 49-59. Thousand Oaks, CA: SAGE Publications. Kowalczyk, Stacy. 2007. "Digital Preservation by Design". In Handbook of Research on Global Information Technology, edited by Raisinghani, Mahesh S.. New York, NY: IGI Publishing. II, Bruce W. Herr, Weixia (Bonnie) Huang, Shashikant Penumarthy, and Katy Börner. 2007. "Designing Highly Flexible and Usable Cyberinfrastructures for Convergence". In Progress in Convergence - Technologies for Human Wellbeing, edited by Bainbridge, William S., and Mihail C. Roco, 161-179. Boston, MA: Annals of the New York Academy of Sciences. Börner, Katy, Shashikant Penumarthy, Bonnie Jean DeVarco, and Carol Kerney. 2005. 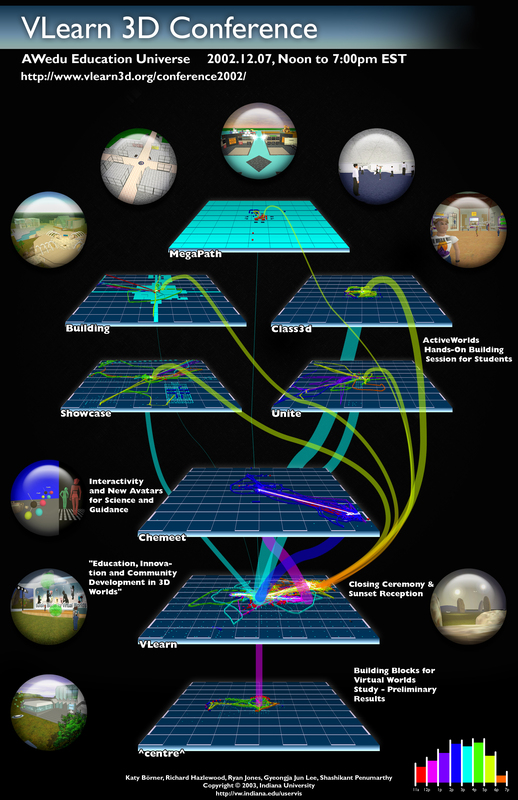 "Visualizing Social Patterns in Virtual Environments on a Local and Global Scale". In Digital Cities III. Information Technologies for Social Capital: Cross-cultural Perspectives, Lecture Notes in Computer Science, edited by Besselaar, Peter van den, and Satoshi Koizumi, 325-340. Berlin: Springer-Verlag. Börner, Katy, and Shashikant Penumarthy. 2003. "Maps of Virtual Worlds". In Information Design Source Book. Tokyo: Graphic-sha Publishing. Chen, Chaomei, and Katy Börner. 2002. "Top Ten Problems in Visual Interfaces of Digital Libraries". In Lecture Notes in Computer Science: Visual Interfaces to Digital Libraries, edited by Börner, Katy, and Chaomei Chen, 226-231. Berlin: Springer-Verlag. Börner, Katy, Rainer Fehr, and Ipke Wachsmuth. 1998. "AkuVis: Interactive Visualization of Acoustic Data. Computer Science for Environmental Protection'98: Networked Structures". In Information Technology, the Environment and Business, edited by Ranze, K. C., and H. D. Haasis, 722-728. Marburg: Metropolis-Verlag. II, Bruce W. Herr, Edmund M Talley, Gully APC Burns, David Newman, and Gavin LaRowe. 2009. "The NIH Visual Browser: An Interactive Visualization of Biomedical Research". Proceedings of the 13th International Conference on Information Visualization (IV09), Barcelona, Spain 505-509. Duhon, Russell Jackson. 2009. "Understanding Outside Collaborations of the Chinese Academy of Sciences Using Jensen-Shannon Divergence". Proceedings of SPIE-IS&T Visualization and Data Analysis Conference, San Jose, CA 7243: 72430C. II, Bruce W. Herr, Russell Jackson Duhon, Katy Börner, Elisha F. Allgood, and Shashikant Penumarthy. 2008. "113 Years of Physical Review: Using Flow Maps to Show Temporal and Topical Citation Patterns". Proceedings of the 12th Information Visualization Conference (IV 2008), London, UK 421-426. II, Bruce W. Herr, Weimao Ke, Elisha F. Allgood, and Katy Börner. 2007. "Movies and Actors: Mapping the Internet Movie Database". Proceedings of the 11th Annual Information Visualization International Conference, Zurich, Switzerland 465-469. II, Bruce W. Herr. 2008. "Using the Network Workbench". Indiana University Bloomington.